This pattern is so pretty! I spent the afternoon ripping and will start continuous line quilting my project tomorrow, with a higher chair and better light. Candi'sEyeCandy asks: "Should I take out the varigated thread on the feather stitch? It kind of stands out like a sore thumb, huh? Also the half wheels I'm not at all happy with either. One answer: Candi's use of variegated thread is perfect. it adds depth and texture. I have had disappointments using variegated thread because the intermittent colors often makes the pattern look lopsided or incomplete. 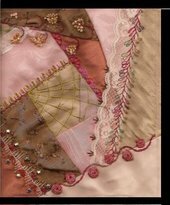 Jacqueline de Jonge paper piecing patterns from the Netherlands are beautiful. i spent a fortune on the pattern called "The Colourful Quilt." Now I wonder if for this much effort and intricacy I should make an original quilt instead of following a pattern.